is healthy comfort food a thing...? 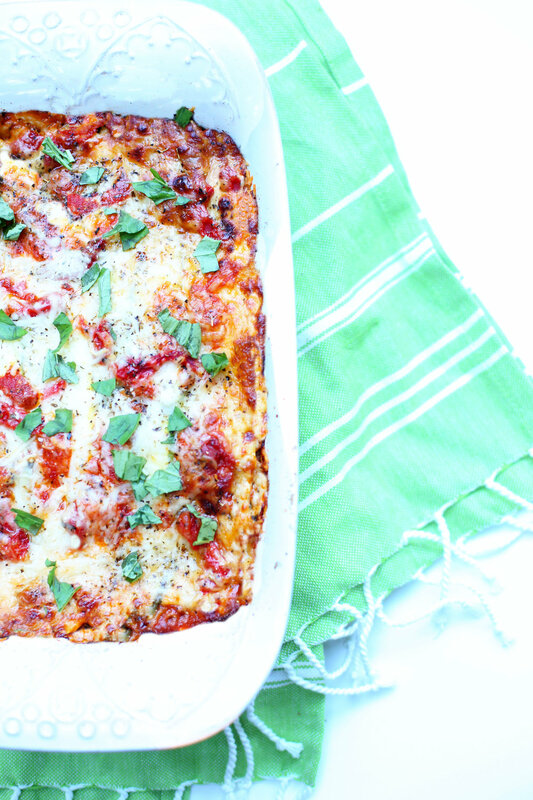 Introducing your new weeknight dinner - Lasagna with a healthy Reboot! It's a dish worth adding to your families Fall and Winter dinner list because what's better than cozying up with a warm plate of lasagna thats not only delicious but good for your waistline!? Processed and high fat ricotta cheese is replaced by a healthy, plant based, spinach "ricotta" (that you wont believe is healthy!). The starchy white pasta is swapped out for whole foods like thinly sliced zucchini and yellow squash and/or minimally processed pasta! Its time we enjoy the comfort foods we love but with no guilt afterwards. 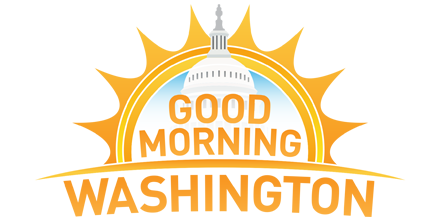 Ask the RD: Can I still enjoy comfort foods and stay healthy / lose weight? Yes, you can still eat these foods! Being healthy doesn't mean you have to give up your favorite foods! Any dish can be Rebooted! Start rethinking some of your recipes by asking yourself: how can I get more wholesome, vegetables into this dish? Its about getting MORE of the good, nourishing foods in, instead of focusing on giving up all of the unhealthy stuff! You should never eliminate the foods you love but, if you balance and pair these foods with healthy options, your body and waistline will thank you. You can start by making little changes to your dishes (maybe its just mincing up spinach or kale and throwing it into a dish like its an herb for an added phytonutrient boost - you wouldn't even taste a difference but your body will!). Swap healthier ingredients for unhealthy ingredients, replace some animal protein for plant based protein (beans, lentils, nuts/seeds, tofu, etc. ), or try to get more whole foods in and therefore, "crowd" out some of the unhealthier ingredients (such as start with half whole wheat pasta and half white pasta and work your way to all whole wheat as you begin to feel the difference. Then you can swap out whole wheat pasta for zucchini "pasta" to give your dish even more of a low-calorie, nutrient boost) to the dishes you love. Research suggests it takes us longer – roughly 10 to 15 exposures – to learn to enjoy the taste of healthier foods, like the bitterness of broccoli or sourness of citrus fruit. By slowly including a wide variety of vegetables, beans/legumes, whole grains, nuts and seeds into your regular diet, those flavors will grow on you and your palate will adjust. There’s more good new, the less sugar and unhealthy fats you eat, the more your physical cravings will fade away! Experiment with cooking with one new healthy ingredient each week. You could add everyday ‘superfoods’ to your meals, like dark leafy greens (kale, collards, watercress, spinach), Brussels sprouts, sweet potatoes, oats, quinoa, or beans/lentils if you don’t normally eat them. Or you could expose your taste buds to more exotic flavors – from sea vegetables, kimchi, and kombucha or whatever you’d like to try! Slowly replace your staple foods for healthier versions. For example, next time you’re out of white rice, buy brown rice, forbidden (black) rice, quinoa, or barely instead. You could also swap your regular cereal for unsweetened muesli, teff, or steel cut oatmeal or choose cold press extra virgin olive oil over low quality vegetable oils. Spice up your meals. Grow a tiny herb garden or grow your own microgreens/sprouts with a Hamama kit (get 10% off with code: ROOTSGROW365) in your windowsill and find ways to enjoy their flavors and antioxidant health benefits as often as you can. I have been growing my own microgreens for 2-3 months now and love it! I top my sandwiches, pizza, pasta, salads, and soups with these nutrient packed greens. Or stock your spice racks with medicinal, disease-fighting, spices: cinnamon, turmeric, ginger, nutritional yeast, chili pepper, garlic and cardamom for flavor instead of adding cream, butter, cheese or oil. Focusing on adding veggies to most of your meals. Your mother, doctor and diet books have all been saying it for years: eat your vegetables. With whatever dish you're enjoying, try to make at least half of your plate non-starchy vegetables (broccoli, carrots, green beans, zucchini, asparagus, etc) or replace your starchy, processed foods like pasta, white rice) with starchy vegetables (sweet potato, corn, peas, ect.) for low calorie, high fiber, and weight loss, disease fighting benefits. Or enjoy a side salad, a vegetable soup or green tea with your meal to get full on wholesome foods/tea in your stomach and crowd out the empty calorie foods. Make even, thinly sliced zucchini and yellow squash planks using a Mandoline. 6. Mozzarella and parmesan cheese. Then repeat layers 1-6 for a second time! I promise, you'll never taste the tofu and your kids wont either! The tofu adds in about 13gm of healthy plant based protein and creaminess to the "ricotta" spread. This recipe is on repeat at my house because it makes so much, perfect for meal prepping for the week. It is easy to portion out and freeze in an airtight container for later! 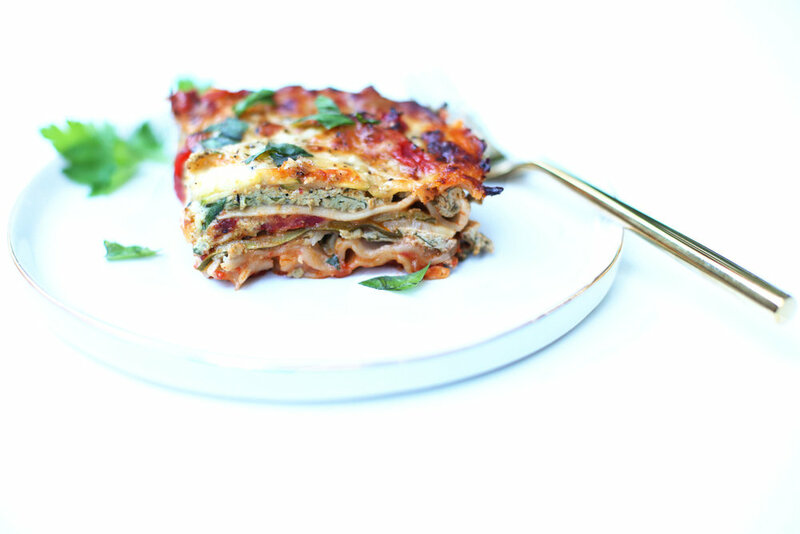 You'll fall in love with this dish and wont believe its a healthy lasagna! Dietary Substitutions: Omit the cheese or modify cheese to vegan cheese to make this vegan. Double the zucchini planks instead of adding brown rice pasta to get even more veggies in and/or to make this recipe Paleo. Make spinach "ricotta." In a food processor or high speed blender, combine cashews, garlic, tofu, chopped fresh spinach, lemon juice, oregano, evoo, red pepper flakes, basil, salt and ground pepper. 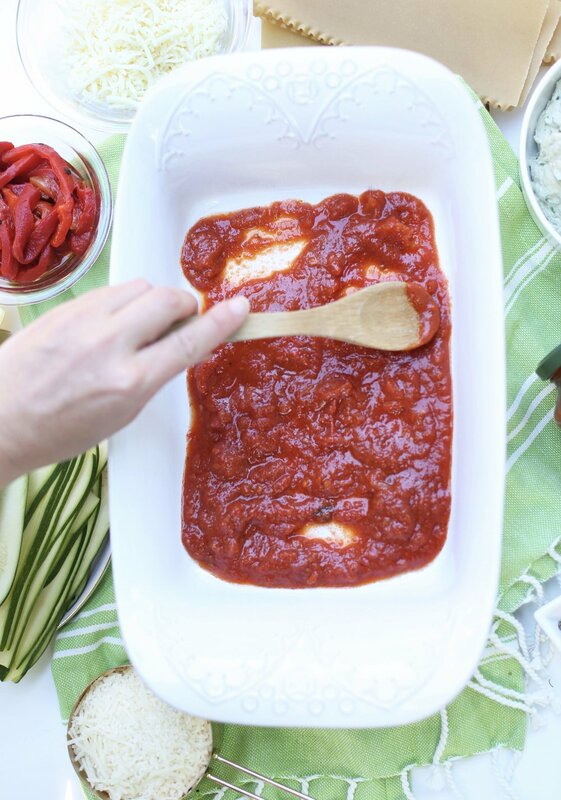 Blend "ricotta" until it is a spreadable consistency. Drizzle a 9 x 13 inch pan with extra virgin olive oil and ~1 cup tomato sauce. First Layer as follows: uncooked lasagna noodles, dollop and spread the ricotta mixture evenly over the noodles, zucchini and yellow squash, roasted red peppers, sprinkle of mozzarella cheese, and lastly spread evenly tomato sauce. Do the above ingredients again for a second layer. Top with parmesan and mozzarella cheese. Bake lasagna, covered, for 35 minutes. Uncover and bake for another 10-15 minutes or until noodles are cooked, zucchini is tender and cheese is bubbling. 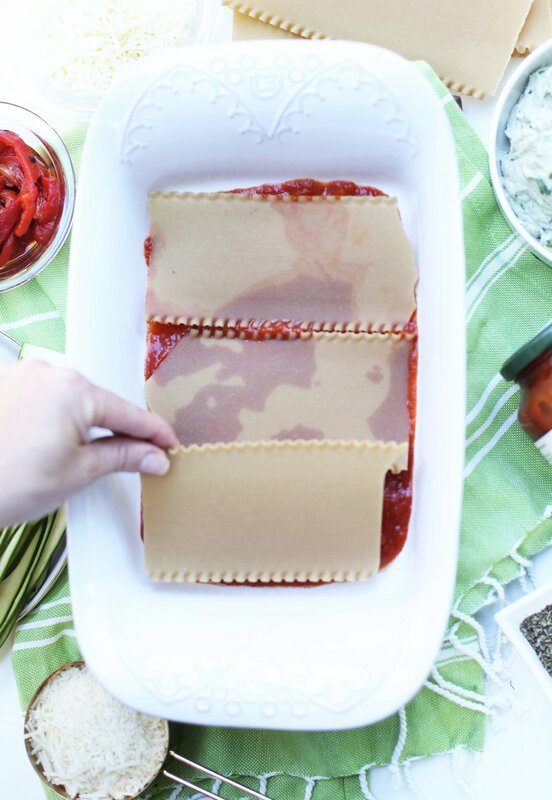 Let lasagna cool for 10 minutes prior to serving. Season with freshly chopped basil and cracked black pepper. Reboot and Enjoy!